Aerosol optical depth; black carbon; forest fires; aerosol index; urban areas. Continuous and campaign-based aerosol field measurements are essential in understanding fundamental atmospheric aerosol processes and for evaluating their effect on global climate, environment and human life. 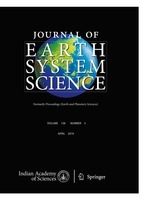 Synchronous measurements of Aerosol Optical Depth (AOD), Black Carbon (BC) aerosol mass concentration and aerosol particle size distribution were carried out during the campaign period at tropical urban regions of Hyderabad, India. Daily satellite datasets of DMSP-OLS were processed for night-time forest fires over the Indian region in order to understand the additional sources (forest fires) of aerosol. The higher values in black carbon aerosol mass concentration and aerosol optical depth correlated well with forest fires occurring over the region. Ozone Monitoring Instrument (OMI) aerosol index (AI) variations showed absorbing aerosols over the region and correlated with ground measurements. Atmospheric Science Section, Oceanography Division, National Remote Sensing Agency (Department of Space, Govt. of India) Balanagar, Hyderabad 500 037, India.